September is National Service Dog Month and these animals and their handlers are truly partners that have a unique bond. According to ServiceDogCentral.org, it is estimated that there are approximately 100,000 to 200,000 service dogs in the United States and this number seems to be growing. Cherry Blossom seen here is a service dog that assists her owner Elizabeth A. Marker from Alabama with anxiety and panic attacks. Service dogs come in all types of breeds and sizes. The term service dog has evolved to include not only seeing-eye dogs but dogs for diabetics, seizures, psychiatric and sensory dogs. Therapy dogs are not service dogs under the current law and are not given the same rights as service dogs. What you might think of as the traditional service dog, just isn't typical anymore. Confusing? Yes and it's becoming increasingly difficult for businesses to determine the difference from an everyday pet and a trained service dog. Service dogs do not require certification. 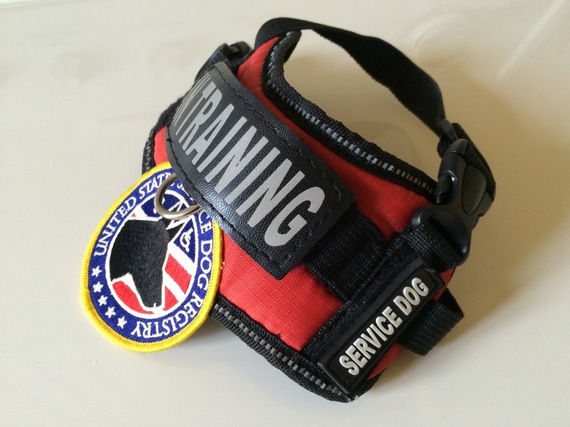 Today anyone can purchase a service dog vest from eBay without any credentials. Service dogs don't need credentials, they just need to be trained to do a specific task that assists their handler. Registering a service dog is purely voluntary and most registry services out there are scams waiting to sell false credentials with no proof that a dog is trained. The most recognized volunteer site to register a service dog is The United States Service Dog Registry, but they also sell products on their website. 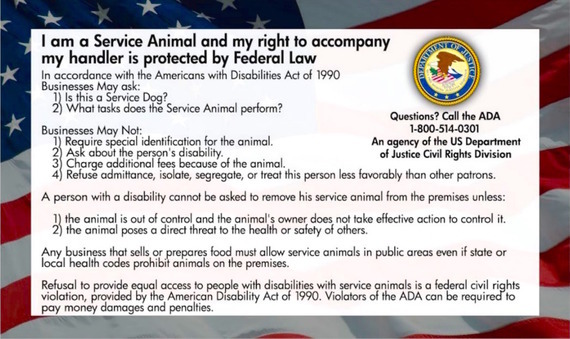 Most people won't question the validity of a service dog and service dog advocates don't want to start a precedent of requiring proof or identification for service animals. The thinking behind this is that people with disabilities already have a difficult enough time and they don't need to be harassed about their service dog. 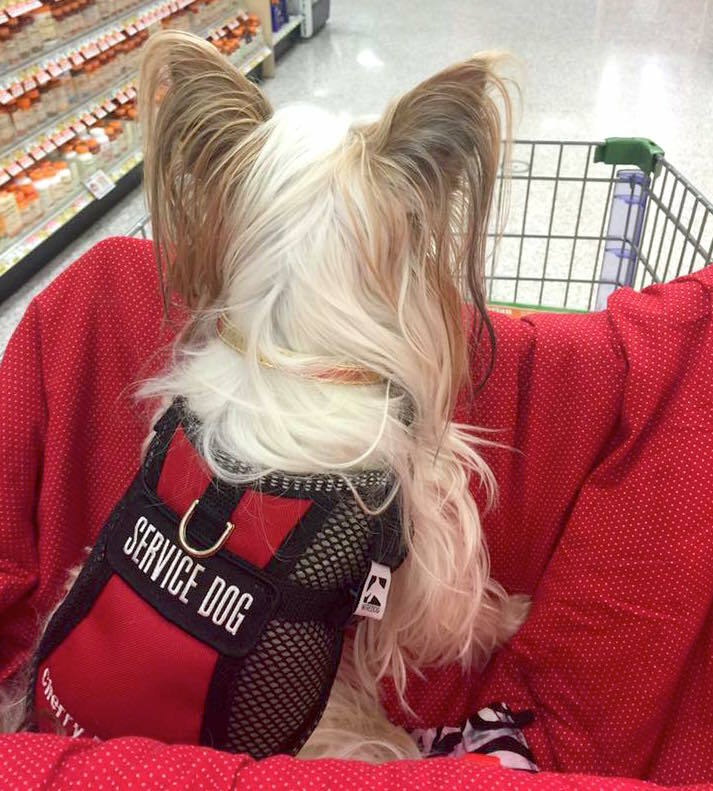 Service dog vests like this one can easily be purchased on the Internet but legitimate service dogs wear the same type of vests. There's no standard vest for service dogs. My husband has a service dog for his diabetes. We have experienced discrimination first hand. We always get the worst hotel rooms that never look like the hotel's website but instead have tile floors and are neglected. We were once told that it's because dogs shed and dog fur gets into the carpets. Our dog happens to be a breed that doesn't shed, but we were sent to their dungeon room anyway. Even housekeeping was surprised that we were there. Now when we make our hotel reservations, we don't tell them about his service dog until after we check-in. Savvy handlers have learned to circumvent challenges of traveling with a service dog. As I began to research this issue, I found that discrimination happens often. Several websites even suggest making your travel arrangements first and only telling the airlines about your service animal a few days before your flight. The reason is that people are often told there are no more seats available on a flight when booking via the telephone. Some of the biggest offenders of discrimination are condos and rental properties. Deborah Fischer is wheelchair-bound and has multiple sclerosis. She experienced discrimination when her trained service dog Sorenson weighed more than her condominium's 20-pound weight limit. She gave the association documentation and photographs to show that her service dog was truly needed. The condo association actually sued her, but then she countersued and the case was settled. Fischer was awarded $300,000 because the association violated the federal Fair Housing Act (FHA). Scott Behren of Behren Law offices in Weston, Florida currently has about four service dog cases. "My current case... the HOA (Home Owners Association) has done everything they can to harass my client because of her service dog. So bad she wants to be bought out and move," said Behren. 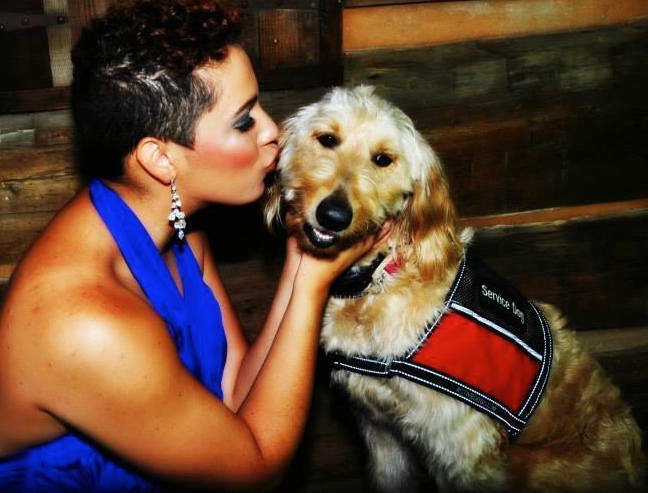 Taylor Loven from North Carolina and her service dog, Sugar. Sugar assists Taylor with complex Post Traumatic Stress Disorder and helps Taylor with panic attacks, and other PTSD triggers. Darlene Sullivan, Executive Director and Founder of Canine Partners for Life, located in Cochranville, Pennsylvania says that discrimination still occurs but educating the offender helps. "When given the proper education, businesses are more than willing to accommodate the presence of a service dog." Sullivan empathizes with business owners who struggle to determine what animals are legitimate service animals and which are not. Service dog fraud is making the problem worse. Pet owners who want to take their dogs into business establishments where dogs are normally not allowed will often claim the animal is a service dog when it is not. Service animals are always well behaved and are trained to do a specific task, even though that task may not be obvious at the moment. Service dog fraud is a growing problem. "I'm horrified by the number of people abusing the ADA (Americans with Disability Act) and putting the legal rights of those with legitimate disabilities and partnerships at risk," said Sullivan. 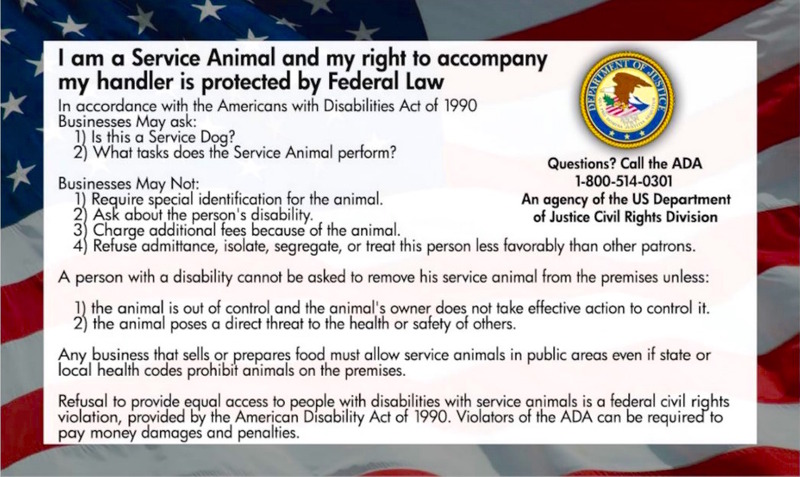 ADA handout stating the ADA rights of handlers with service dogs. This handout can be printed or purchased in bulk on the web. If you experience discrimination, take a deep breath. Don't look for a fight. Stay calm. Educate the person and give them a copy of the law. Offer to come back to educate their staff. It's rarely necessary but you can also file an ADA complaint online with the Department of Justice at http://www.ada.gov/complaint.